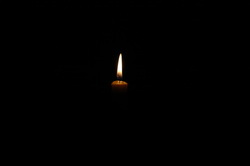 The light from a single candle flame overcomes darkness. The Light of God overcomes even blindness. Leading from the front, Jesus demonstrated to the world as well as to His disciples "what right looks like" in the Father's eyes. We are not saved by good works, but so that we are able to do them. Our good works are not done for our own glory and in our own name. Instead, they are done for His glory and in His name, so that all that see them glorify God. Worship is much more than music. It is the totality of a life that is lived for the glory and praise of God. We are commanded to do our alms in secret, so that our Father will reward us in secret, as opposed to seeking the reward of men. Nevertheless, we are also commanded to let our light shine before men, so that they may glorify God. Praising God in word, in deed, and in song, in a public arena, with a heart that is seeking glory for God only, is a powerful tactic against the forces of darkness. The world, as part of the modern cultural war, is doing everything in its power to restrict any semblance of worshiping Jesus Christ to the church campus and to the family residence. They want the good works; just don't mention that Name they plead! We should submit to human authority, except were it contravenes the scriptures. Good works will put to silence foolish men; rather than foolish men put to silence the Word of God! Military doctrine employs proper lighting as one component of physical security measures, and for force protection. City streets that are well lighted have significantly lower crime rates.